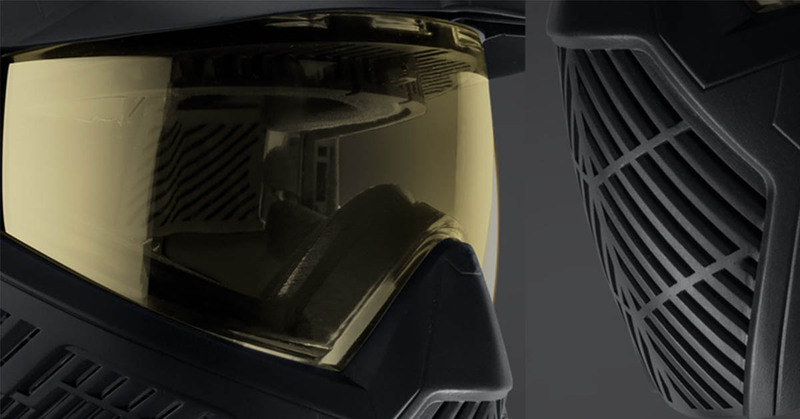 NEW BASE goggle systems have arrived at Spec Ops and are now included in the Corporal, Commando and Black Ops Packages! A little while ago, we came across these awesome new BASE goggle systems and we put them to the test over a three month trial period. They were excellent. They hit the trifecta with a combination of insanely good fit, breathability and protection, with the added bonus of a larger field of vision. We knew you would appreciate the best equipment out there, so we upgraded our entire fleet, and the BASE goggle system now comes with the Corporal, Commando and Black Ops Package! The canted venting across the front of the mask allows air to disperse more easily, making it a hell of a lot easier to hear and speak to other players when you’re on the field (if you can hear anything over the massive rush of blood to your head, that is). The venting also means better ventilation so it’s easier to breathe, and minimises fogging so you can see clearly even when chaos reigns around you. Inside the face mask, there’s soft, breathable and moisture-wicking foam. It’s heaps more comfortable than the older style of chunky, firmer foam lining, so no minor irritants are distracting you from the task at hand. Better still, for the optically-challenged among us, you can keep your glasses on under the goggles. No excuses now! Now, we still resist the idea that paintballs hurt…Much. But, we acknowledge that a little protection from a flurry of paintballs zinging at you across the field is a good idea. The BASE goggle system is made of ballistic nylon construction, which is designed to divert shell fragmentation. What’s more, it actually meets and exceeds all ASTM paintball safety standards. With its wide-angle lens, the BASE goggle system gives you a much bigger field of vision than usual rental masks. The thermal lens is double-layer, and designed to eliminate distortion and glare, minimise fogging and provide maximum eye protection. You’ll see the enemy cowering in the distance with no trouble! They’ve really thought about everything with this one. The shape of the mask is contoured for a more comfortable fit, and there’s an adjustable goggle strap with silicone, non-slip and moisture-wicking coating and a built-in chin strap. These may seem like minor details, but they’re things that can make a difference in the heat of battle. Just ask Francis. Come and check out the BASE goggle system and see what a difference it makes to your game! Book online for your Spec Ops experience now.